My Mom’s Mom, Wilma Lorraine Gwendolyn Waddill Hale is dying. She has decided everything in her life, except the many losses. She would become a widow in her 20’s with three young girls to raise on her Mom’s ranch. Not her decision to leave business school with her new husband that the ranch would take from her so soon. She would lose her Mom and her daughter, my Mom, both to surgical complication. She would not remarry. She would take a business job in town, raise her girls well and become a fixture in her community that included bridge club, Eastern Star and Legion Club dances. She might be sad, but never bitter. She would empower, encourage and challenge all of her grandchildren. 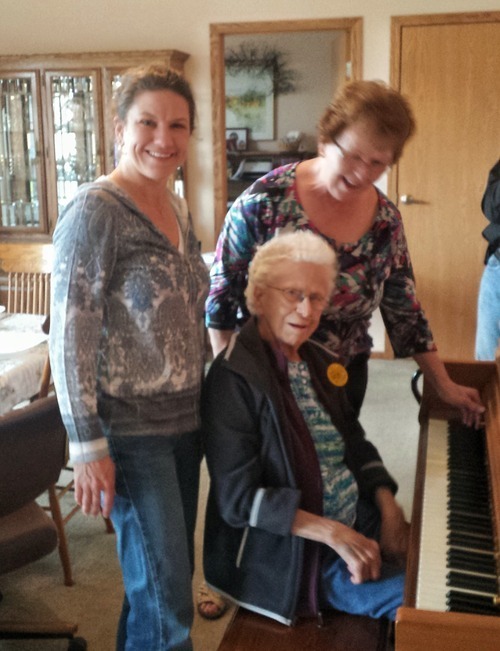 We just celebrated her birthday in Montana with pre-dinner piano playing (by her), prime rib and angel food cake. She now faces death, the afterlife, with almost demanding demeanor, wishing for her own end of life at 96. It is possible she fears being unable to be the independent, determined woman she has been for 35,049 days. To even imagine that someone would need to take care of her, push her around in a chair, is likely unfathomable. Maybe it isn’t fear at all but the decision to just bypass that phase of dependence. I am confused by this expectation and determination. Is it possible to be done even if the body has time left? I cannot truly know or imagine what she may be feeling at this time. Practicality under all circumstances would be her greatest example for me. Also, how do you know if you haven’t experienced it or tried it? This way of living was the antithesis of drama – it had no place and rarely had energy (for long.) She carried on her Mom’s strength of principle and would instill this in my Mom and she in me. A second-generation Irish ranch woman in Nebraska with a business degree from Colorado born on Flag Day in 1918. There are so many fond memories of my Mom’s Mom but the most recent and most defining is her sitting with my husband taking notes as he helped her with her new Kindle Fire. Explaining ever so carefully how the ‘touch’ worked and differed from her first Kindle. All with her new red nails, her first ever manicure. Gram I’m sorry you fell. That you feel tired. I admire your strength and determination. I want you to know we will miss you when you are not physically with us, whenever that will be.